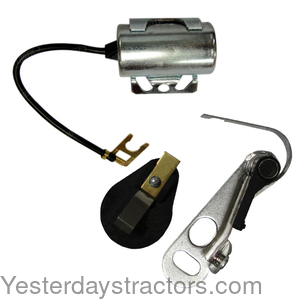 Ignition kit For DELCO distributor with CLIP held cap. VERIFY DISTRIBUTOR NUMBER TO ENSURE FIT. Contains points, condenser, and rotor. For: 200B, 210, 211, 211B, 300, 310, 300B, 320, 350, 351, 400, 400B, 420, 430, 440, 441, 450, 500, 500B, 580CK, 600, 600B, 640, 640C, 641, 641C, D, DC, DC3, DC4, DO, S, SC, SI, SO, 200, 200B, 210B, 211B. For Delco distributor numbers 1111411, 1111908, 1111909. New, aftermarket Ignition Kit, Delco Clip-Held Cap Distributor for sale with a solid manufacturer warranty. In addition, we have a generous 30-day return policy if this Case Ignition Kit, Delco Clip-Held Cap Distributor for Case 310, 400B, 420, 500B, 600B, 200B, 210, 211, 211B, 300, 300B, 320, 350, 351, 400, 430, 440, 441, 450, 500, 500B, 580CK, 600, 640, 640C, 641, 641C, D, DC, DC3, DC4, DO, S, SC, SI, SO, 200, 200B, 210B, 211B tractors needs to be returned for any reason. Please see our Parts Warranty and Return Policy links on your left for complete details before returning.